We live in dynamic times and it is critical that businesses transform themselves constantly with the help of new technology. Even as we speak, mobile apps are taking the world by storm. Innovative entrepreneurs are thinking ahead and quickly getting on the mobile app bandwagon. 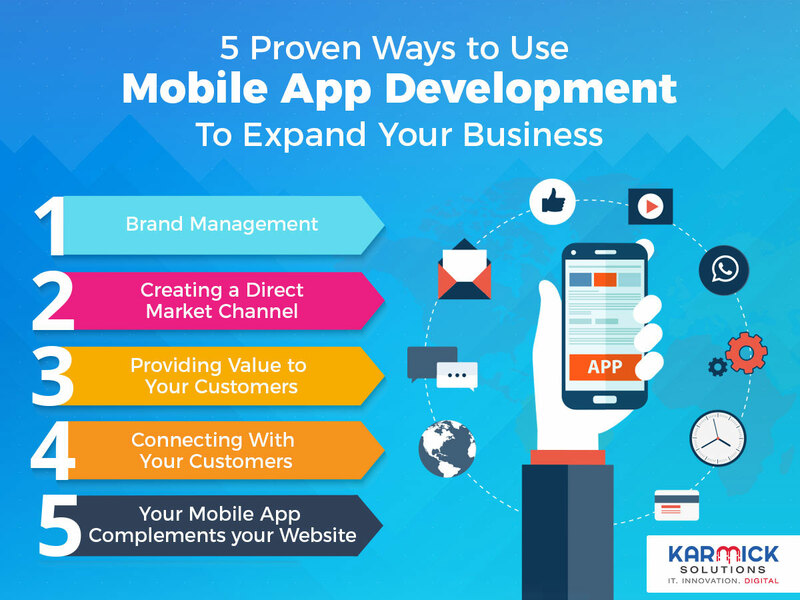 We discuss below five ways in which mobile apps can help add value to any business. When a business puts its logo or slogan on its App, it is essentially creating a property that will always stay on top of the mind of the target customer. If your key demography has downloaded your app on their phones, your logo will always be visible to them and you will be the first name they will think of when they have to avail products or services in your domain. Furthermore, every time your logo is visible to your target customer, it is a missed opportunity for your competitor who did not invest in mobile applications. Thus, having a visible mobile app goes a long way in adding brand value to your business. Apps serve multiple functions. They can provide news feeds, general info, messengers, prices, user accounts, booking forms, and search features etc. Undoubtedly, the biggest benefit of possessing a mobile app for your business is that you can always instantaneously convey the latest updates and innovation about your company to your customers. Be it the launch of a new product or service or a new promotional sales offer, you have a direct line of communication with your customers and that is an attribute not be taken lightly. Gone are the days when loyalty programs where deployed through the mechanism of point collection cards. Now, customers can collect their reward points much more readily through their mobile apps. This creates ease of use and enticesthe customer to keep coming back for more. Customer services have now moved well beyond the traditional agent and customer relationship which always took place face-to-face. With billions of people now accessing businesses through the ease of mobile apps, that is where the next breakthrough in customer services solutions lies. Conducting customer service through mobile applications has its own distinct advantages. First of all, a mobile app does not suffer from the probability of faltering or fatigue that human customer service professionals are subject to. Secondly, when a customer interacts with a mobile app, there is uniformity in customer service relations. They do not have to talk to a different person every time. Last but not least, building strong customer service relationships with your customers through a mobile app means that you are with them all the time and not just during the customary business hours. Many small businesses and especially cash-crunched startups often question the decision of having an additional mobile application for their businesses when they already have a functional business going. The truth of the matter is that a mobile app is of paramount importance to the holistic business strategy of any organization. A mobile app complements a website. If a website attracts new customers, the mobile application will create brand loyalty. Over and above the aforementioned, having a mobile app has other distinct advantages too. It is more readily accessible to the target customerthan a website as it can be accessed with the touch of a fingertip as opposed to typing out the entire URL of a website. Furthermore, such is the interface of mobile apps that they tend to be much more two-way or interactive than traditional websites thereby engaging the customers in a much more enriching way.